Australia™s premier brand of kitchen products, BREVILLE, is making it easier for consumers to BREVILLE-lize their kitchens this holiday with special promotions that offer huge savings, easy monthly payments, and free items when they purchase a group of items that include an espresso machine and a blender. 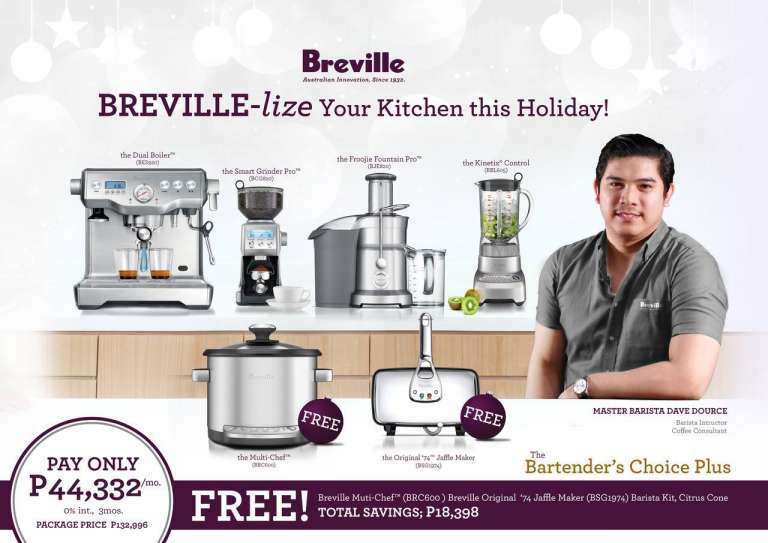 IAJ Wellness Corp., the exclusive distributor of BREVILLE in the Philippines, is bringing cheers this Christmas through its limited promotions “ Kitchen Diva Specials and Bartender™s Choice Plus “ that offer an array of kitchen products that will make cooking and preparing beverages a breeze, while transforming the kitchen into a haven for chefs and would-be chefs. Kitchen Diva Specials, for instance, is being offered at P30,999 per month, zero interest, payable in three months, giving consumer total savings of P18,599.Â The package includes the Barista Express (espresso machine), Smart Oven, Multi-Chef (a multi-cooker), Misso s2o (which extracts virgin oil from small seeds), Kinetix Control (a multi-tasking blender).Â A Compact Kettle, Citrus Cone, Barista Kit and Misso Starter Kit will be given away for free when customers avail of this package. At P44,332 per month, payable in three months at zero interest, Bartender™s Choice Plus is a steal. 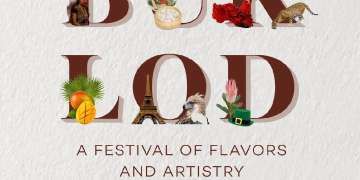 The package, which will give customers total savings of P18,398, includes a Dual Boiler (a cutting-edge espresso machine), Smart Grinder Pro (60-setting coffee bean grinder), Froojie Fountain Pro (dual dsc juicer for watery and fibrous fruits) and the Kinetix Control (a 7-task blender). 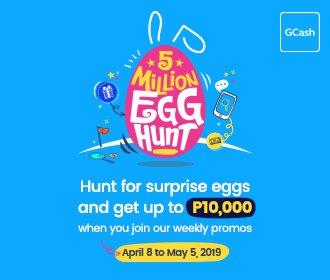 Customers will be given two products for free if they avail of this package the Multi-Chef and the Original 74 Jaffle Maker (a classic sandwich maker), as well as a Barista Kit and Citrus Cone (citrus juice extractor). What’s more, BREVILLE products are designed to be versatile that they can fit in any kitchen design, so there is no need to redecorate once customers purchase them. Aside from Kitchen Diva Specials and Bartende’s Choice Plus, IAJ Wellness is also offering the Kitchen Basics package. Another easy-on-the-pocket package, Kitchen Basics is being offered at P15,666 a month for three moths and is also interest-free. The package, a must for every chef and would-be chef, includes Smart Oven Pro, Kinetix Twist, Juice Fountain and Multi-Chef. Customers who will avail of this package can have the Compact Kettle, Juicing Kit and Citrus Cone all for free. Because BREVILLE products could last longer than other brands, customers are assured that they get their money’s worth. 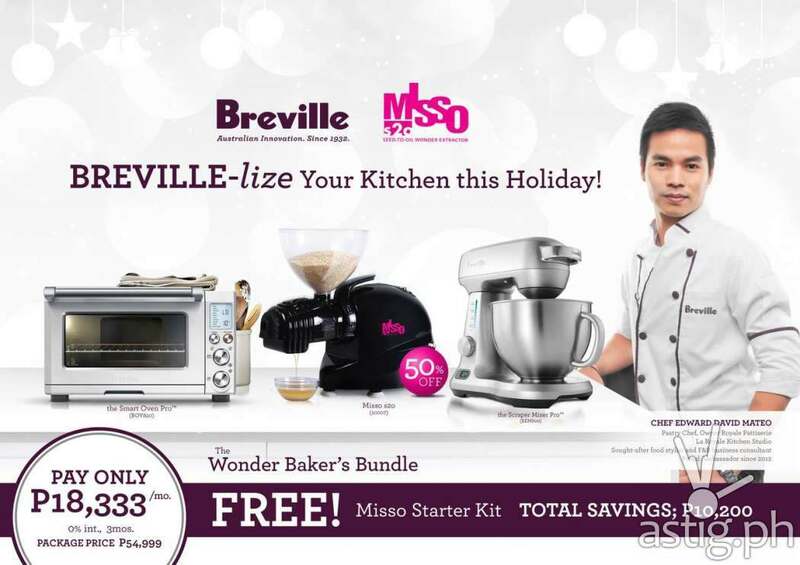 Apart from these promotional packages, BREVILLE has more in store for discriminating kitchen divas and chefs. For those who want their fruit juice fresh every time they want to quench their thirst, the BREVILLE Juicers are perfect for them. A BREVILLE Juicer extracts 70 percent more nutrients from the fruit because of its patented titanium-reinforced nutri disk. It extracts juice in a minute because of its 84 mm extra-wide feed chute, and what’s more, no slicing and chopping is needed. 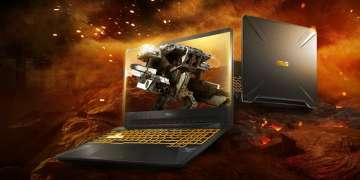 They are also designed for easy cleaning. In addition, BREVILLE also has the Kinetix Pro Blender, an easy to operate blender because of its one-touch function. Because of its multi-functionality, it results in creamier smoothie, smother nut butter and ice as fine as snow due to its Kinetix blade and bowl-hugging system. Also, this blender is durable because of its shatterproof Tritan jug, and it’s easy to clean because of its one-piece removable blade. 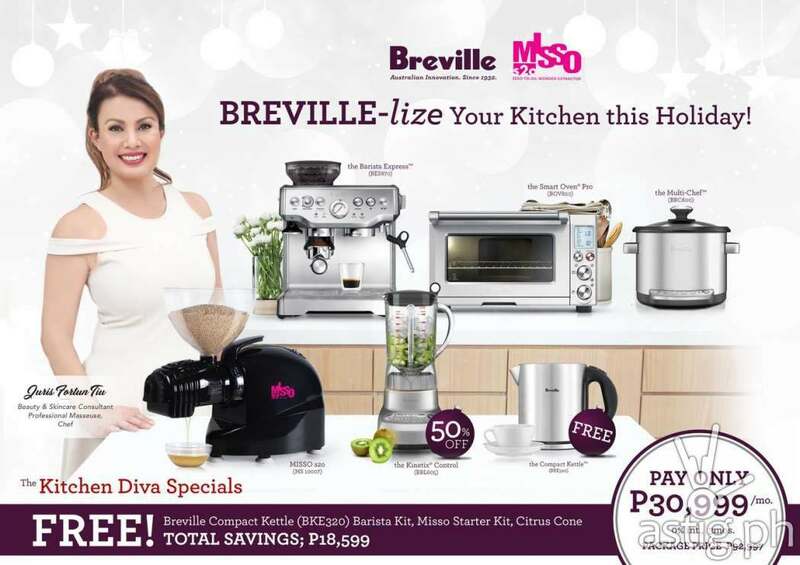 BREVILLE, the trusted brand since it started manufacturing kitchen products in 1932, is available in leading retail outlets in the country such as SM Home, SM Appliance, Rustans, True Value, Landmark, Ansons, Automatic Center. 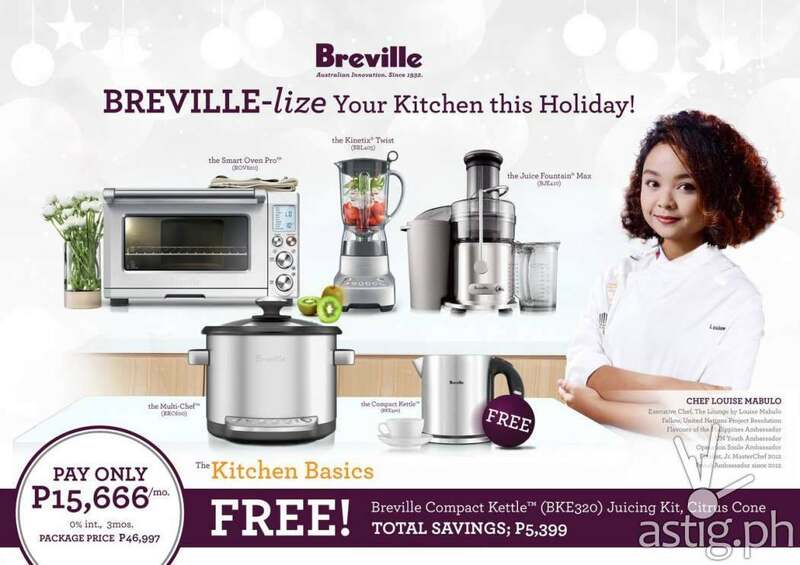 They can also be purchased online through www.BREVILLE.com.ph , Lazada, Knots & Pans. Follow BREVILLE Phils on Facebook and Instagram for real-time updates and promos.